Romanian orthodox wedding traditions, braking and catching of the traditional bridal cake (sweet bread). This traditional Romanian wedding nuptials took place at the first Romanian church in Las Vegas, Nevada, “Saint George and Saint Dimitri the New” Romanian Orthodox Church. Before the ceremony, the groom with the guys, a violin player and a ceremony master came over to the house where the bride was getting ready with her bridesmaids to ask for her hand in marriage and take her to the church to get married in front of God. As part of their traditions, the groomsman gave the bouquets to the bridesmaids and the couple pinned the boutonnieres on the guys. Than, right before leaving for the church, the godmother hold and broke a traditional bridal cake (sweet bread) over the bride’s head, and through the 4 pieces to four different directions to the guest to eat. 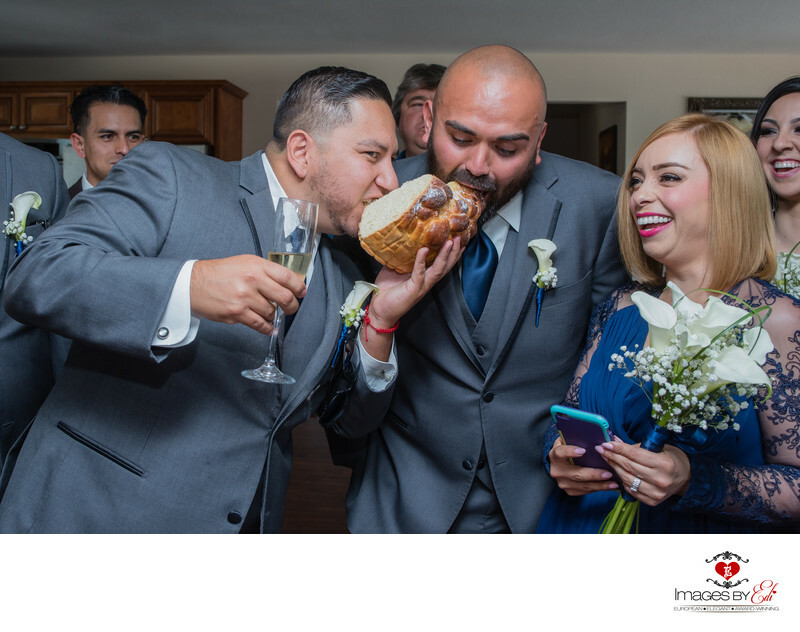 This moment was captured after 2 groomsman caught the cake and took a bite of it. Location: Private house, Las Vegas, NV.